Tramataj (Tramadol) 50mg/ml Solution for Injection or Infusion. Each ampoule contains 100mg Tramataj (Tramadol) hydrochloride in 2ml solution (50mg/ml). A clear colourless solution in glass ampoules. For the treatment and prevention of moderate to severe pain. Tramataj (Tramadol) 50mg/ml Solution for Injection should not be administered for longer than absolutely necessary. If long-term pain treatment with Tramataj (Tramadol) 50mg/ml Solution for Injection is necessary in view of the nature and severity of the illness, then careful regular monitoring should be carried out (if necessary with breaks in treatment) to establish whether, and to what extent, further treatment is necessary. The dose should be adjusted to the intensity of the pain and the sensitivity of the individual patient. The lowest effective dose for analgesia should generally be selected. The total daily dose of 400mg Tramataj (Tramadol) hydrochloride should not be exceeded, except in special clinical circumstances. The Tramataj (Tramadol) solution is for parenteral injection either intramuscularly, by slow intravenous injection or diluted in solution (see Section 6.6 Special instructions for use and handling) for administration by infusion or patient controlled analgesia. The usual dose is 50mg or 100mg 4 to 6 hourly by either intramuscular or intravenous routes. Intravenous injections must be given slowly over 2–3 minutes. The dose should be adjusted according to the severity of the pain and the response. For post-operative pain, an initial bolus of 100mg is administered. During the 60 minutes following the initial bolus, further doses of 50mg may be given every 10-20 minutes, up to a total dose of 250mg including the initial bolus. Subsequent doses should be 50mg or 100mg 4- 6 hourly up to a total daily dose of 400mg. A dose adjustment is not usually necessary in patients up to 75 years without clinically manifest hepatic or renal insufficiency. In elderly patients over 75 years elimination may be prolonged. Therefore, if necessary the dosage interval is to be extended according to the patient’s requirements. In patients with renal and/or hepatic insufficiency the elimination of Tramataj (Tramadol) is delayed. In these patients prolongation of the dosage intervals should be carefully considered according to the patient’s requirements. Tramataj (Tramadol) 50mg/ml Solution for Injection should not be given to patients who have previously demonstrated hypersensitivity towards Tramataj (Tramadol) or any of the other ingredients (see Section 6.1 for ‘list of excipients’). Tramataj (Tramadol) 50mg/ml Solution for injection should not be given to patients suffering from acute intoxication with alcohol, hypnotics, centrally acting analgesics, opioids or psychotropic drugs. In common with other opioid analgesics, Tramataj (Tramadol) should not be administered to patients who are receiving monoamine oxidase inhibitors or within two weeks of their withdrawal (see section 4.5 ‘Interaction with other medicinal products and other forms of interaction’). Tramataj (Tramadol) 50mg/ml Solution for Injection is contraindicated in patients with epilepsy not adequately controlled by treatment. Tramataj (Tramadol) must not be used in narcotic withdrawal treatment. At therapeutic doses, Tramataj (Tramadol) has the potential to cause withdrawal symptoms. Rarely, cases of dependence and abuse have been reported. At therapeutic doses withdrawal symptoms have been reported at a frequency of 1 in 8,000. Reports of dependence and abuse have been less frequent. Because of this potential the clinical need for continued analgesic treatment should be reviewed regularly. Tramataj (Tramadol) has a low dependence potential. On long term use tolerance, psychic and physical dependence may develop. In patients with a tendency to drug abuse or dependence, treatment should be for short periods and under strict medical supervision. Tramataj (Tramadol) 50mg/ml Solution for Injection is not a suitable substitute in opioid dependent patients. The product does not suppress morphine withdrawal symptoms although it is an opioid agonist. 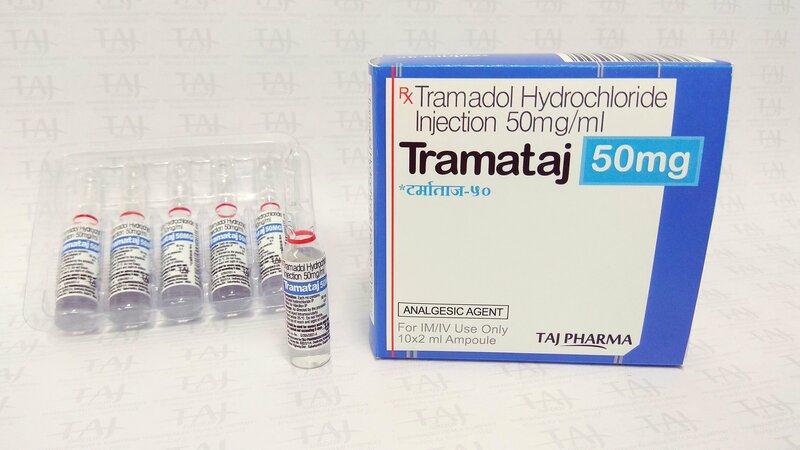 Tramataj (Tramadol) 50mg/ml Solution for Injection should be used with caution in opioid-dependent patients, patients with head injury, a reduced level of consciousness of uncertain origin, disorders of the respiratory centre or function, increased intracranial pressure, severe impairment of hepatic and renal function and in patients prone to convulsive disorders or in shock. In patients sensitive to opiates the product should only be used with caution. Convulsions have been reported at therapeutic doses and the risk may be increased at doses exceeding the usual upper daily dose limit (400mg). Patients with a history of epilepsy or those susceptible to seizures should only be treated with Tramataj (Tramadol) if there are compelling reasons. The risk of convulsions may increase in patients taking Tramataj (Tramadol) and concomitant medication that can lower the seizure threshold (see section 4.5 ‘Interactions with other Medicinal Products and other Forms of Interactions’). Care should be taken when treating patients with respiratory depression, or if concomitant CNS depressant drugs are being administered, or if the recommended dosage is significantly exceeded, as the possibility of respiratory depression cannot be excluded in these situations. At therapeutic doses respiratory depression has infrequently been reported. In one study using a nitrous oxide/opioid (Tramataj (Tramadol)) anaesthetic technique (with only intermittent administration of enflurane ‘as required’) Tramataj (Tramadol) was reported to enhance intra- operative recall. Hence its use during potentially very light planes of general anaesthesia should be avoided. Two studies of Tramataj (Tramadol) administration during anaesthesia comprising continuous administration of isoflurane have shown clinically significant lightening of anaesthetic depth or intra-operative recall. Therefore providing the current practice of administering continuous, potent (volatile or intravenous) anaesthetic agent is followed, Tramataj (Tramadol) may be used intra- operatively in the same way as other analgesic agents are routinely used. This medicinal product contains approximately 8.29mg sodium acetate trihydrate (1.4mg sodium) per 2ml dose. Tramataj (Tramadol) 50mg/ml Solution for Injection should not be combined with MAO inhibitors (see Section 4.3 ‘Contraindications’). In patients treated with MAO inhibitors in the 14 days prior to the use of the opioid pethidine, life-threatening interactions on the central nervous system, respiratory and cardiovascular function have been observed. The same interactions with MAO inhibitors cannot be ruled out during treatment with Tramataj (Tramadol) 50mg/ml Solution for Injection. Concomitant administration of Tramataj (Tramadol) 50mg/ml Solution for Injection with other centrally acting drugs, including alcohol, may potentiate CNS depressant effects (see Section 4.8 ‘Undesirable Effects’). Tramataj (Tramadol) can induce convulsions and increase the potential for selective serotonin reuptake inhibitors (SSRIs), serotonin-norepinephrine reuptake inhibitors (SNRIs), tricyclic antidepressants, antipsychotics and other seizure threshold-lowering medicinal products (such as bupropion, mirtazapine, tetrahydrocannabinol) to cause convulsions. Theoretically there is a possibility that Tramataj (Tramadol) could interact with lithium. There have been no reports of this potential interaction. Hypertonia and body temperature > 38 °C and inducible or ocular clonus. Withdrawal of the serotonergic drugs usually brings about a rapid improvement. Treatment depends on the type and severity of the symptoms. There have been isolated reports of interaction with coumarin anticoagulants resulting in an increased INR with major bleeding and ecchymoses in some patients and so care should be taken when commencing treatment with Tramataj (Tramadol) in patients on anticoagulants. Pharmacokinetic studies were conducted to investigate the effects of cimetidine, quinidine and carbamazepine on the pharmacokinetics of Tramataj (Tramadol). Carbamazepine – The simultaneous administration of carbamazepine markedly decreases serum concentrations of Tramataj (Tramadol) to an extent that a decrease in analgesic effectiveness and a shorter duration of action may occur. Cimetidine – With the concomitant or previous administration of cimetidine clinically relevant interactions are unlikely to occur. Therefore no alteration of the Tramataj (Tramadol) dosage regimen is recommended for patients receiving chronic cimetidine therapy. Quinidine – A study in 12 healthy volunteers has shown that quinidine causes an approximate 25% increase in the Tramataj (Tramadol) Cmax and AUC; Tmax is unaffected. However, the increases in Cmax and AUC fall within the normal therapeutic range for Tramataj (Tramadol), and no dosage adjustment is required. Other active substances known to inhibit CYP3A4, such as ketoconazole and erythromycin, might inhibit the metabolism of Tramataj (Tramadol) (N-demethylation) probably also the metabolism of the active O-demethylated metabolite. The clinical importance of such an interaction has not been studied (see section 4.8). In a limited number of studies the pre- or postoperative application of the antiemetic 5-HT3 antagonist ondansetron increased the requirement of Tramataj (Tramadol) in patients with postoperative pain. Animal studies with Tramataj (Tramadol) at very high doses have revealed effects on organ development, ossification and neonatal mortality Tramataj (Tramadol) crosses the placenta. There is inadequate evidence available on the safety of Tramataj (Tramadol) in human pregnancy, therefore Tramataj (Tramadol) 50mg/ml Solution for Injection should not be used in pregnant women. Tramataj (Tramadol) – administered before or during birth – does not affect uterine contractility. In neonates it may induce changes in the respiratory rate which are usually not clinically relevant. Chronic use during pregnancy may lead to neonatal withdrawal symptoms. Tramataj (Tramadol) and its metabolites are found in small amounts in human breast milk. An infant could ingest 0.1% of the dose given to the mother. Tramataj (Tramadol) 50mg/ml Solution for Injection should not be administered during breast-feeding. After a single administration of Tramataj (Tramadol) however, it is not usually necessary to interrupt breast feeding. Post marketing surveillance does not suggest an effect of Tramataj (Tramadol) on fertility. Animal studies did not show an effect of Tramataj (Tramadol) on fertility. Tramataj (Tramadol) 50mg/ml Solution for Injection may cause somnolence and dizziness and these effects may be potentiated by alcohol and other CNS depressants. Ambulant patients should be warned not to drive or operate machinery if affected. Rapid intravenous administration may be associated with a higher incidence of adverse effects and therefore should be avoided. The most commonly reported adverse drug reactions are nausea and dizziness, both occurring in more than 10 % of patients. Uncommon: cardiovascular regulation (palpitation, tachycardia, postural hypotension or cardiovascular collapse). These adverse effects may occur especially after intravenous administration and in patients who are physically stressed. Rare: bradycardia, increase in blood pressure. Rare: changes in appetite, paraesthesia, tremor, epileptiform convulsions, involuntary muscle contractions, abnormal coordination, syncope, speech disorders. Epileptiform convulsions occurred mainly after administration of high doses of Tramataj (Tramadol) or after concomitant treatment with medicinal products which can lower the seizure threshold (see sections 4.4 and 4.5). Rare: hallucinations, confusion, sleep disturbance, delirium, anxiety and nightmares. Psychic side effects may occur following administration of Tramataj (Tramadol), which vary individually in intensity and nature (depending on personality and duration of medication). These include changes in mood (usually elation, occasionally dysphoria), changes in activity (usually suppression, occasionally increase) and changes in cognitive and sensorial ability (e.g. decision behaviour, perception disorders). Dependence may occur. Rare; blurred vision, miosis, mydriasis. Common: vomiting, constipation, dry mouth. Uncommon: dermal reactions (e.g. pruritus, rash, urticaria). In a few isolated cases, increases in liver enzyme values have been reported in a temporal connection with the therapeutic use of Tramataj (Tramadol). Symptoms of withdrawal reactions, similar to those occurring during opiate withdrawal, may occur as follows: agitation, anxiety, nervousness, insomnia, hyperkinesia, tremor and gastrointestinal symptoms. Other symptoms that have very rarely been seen with Tramataj (Tramadol) discontinuation include: panic attacks, severe anxiety, hallucinations, paraesthesias, tinnitus and unusual CNS symptoms (i.e. confusion, delusions, personalisation, derealisation, paranoia). In principle, on intoxication with Tramataj (Tramadol) symptoms similar to those of other centrally acting analgesics (opioids) are to be expected. These include in particular miosis, vomiting, cardiovascular collapse, consciousness disorders up to coma, convulsions and respiratory depression up to respiratory arrest. In case of intoxication orally, gastrointestinal decontamination with activated charcoal or by gastric lavage is only recommended within 2 hours after Tramataj (Tramadol) intake. Gastrointestinal decontamination at a later time point may be useful in case of intoxication with exceptionally large quantities. Tramataj (Tramadol) is minimally eliminated from the serum by haemodialysis or haemo-filtration. Therefore treatment of acute Tramataj (Tramadol) intoxication with haemodialysis or haemofiltration alone is not suitable for detoxification. Tramataj (Tramadol) 50mg/ml Solution for Injection is a centrally acting analgesic. It is a non-selective pure agonist at mu, delta and kappa opioid receptors with a higher affinity for the mu receptor. Other mechanisms, which may contribute to its analgesic effect, are inhibition of neuronal reuptake of noradrenaline and enhancement of serotonin release. Tramataj (Tramadol) has an antitussive effect. In contrast to morphine, analgesic doses of Tramataj (Tramadol) over a wide range have no respiratory depressant effect. Also gastrointestinal motility is less affected. Effects on the cardiovascular system tend to be slight. The potency of Tramataj (Tramadol) is reported to be 1/10 (one tenth) to 1/6 (one sixth) that of morphine. Effects of enteral and parenteral administration of Tramataj (Tramadol) have been investigated in clinical trials involving more than 2000 paediatric patients ranging in age from neonate to 17 years of age. The indications for pain treatment studied in those trials included pain after surgery (mainly abdominal), after surgical tooth extractions, due to fractures, burns and traumas as well as other painful conditions likely to require analgesic treatment for at least 7 days. At single doses of up to 2 mg/kg or multiple doses of up to 8 mg/kg per day (to a maximum of 400 mg per day) efficacy of Tramataj (Tramadol) was found to be superior to placebo, and superior or equal to paracetamol, nalbuphine, pethidine or low dose morphine. The conducted trials confirmed the efficacy of Tramataj (Tramadol). The safety profile of Tramataj (Tramadol) was similar in adult and paediatric patients older than 1 year (see section 4.2). More than 90% of Tramataj (Tramadol) is absorbed after oral administration. The mean absolute bioavailability is approximately 70 %, irrespective of the concomitant intake of food. The difference between absorbed and non-metabolised available Tramataj (Tramadol) is probably due to the low first-pass effect. The first-pass effect after oral administration is a maximum of 30 %. Tramataj (Tramadol) has a high tissue affinity (V d,ß= 203 + 40 l). It has a plasma protein binding of about 20 %. Following a single oral dose administration of Tramataj (Tramadol) 100 mg as capsules or tablets to young healthy volunteers, plasma concentrations were detectable within approximately 15 to 45 minutes within a mean Cmax of 280 to 208 mcg/L and Tmax of 1.6 to 2h. Tramataj (Tramadol) passes the blood-brain and placental barriers. Very small amounts of the substance and its O-desmethyl derivative are found in the breast-milk (0.1 % and 0.02 % respectively of the applied dose). In humans Tramataj (Tramadol) is mainly metabolised by means of N- and O-demethylation and conjugation of the O-demethylation products with glucuronic acid. Only O-desmethylTramataj (Tramadol) is pharmacologically active. There are considerable interindividual quantitative differences between the other metabolites. So far, eleven metabolites have been found in the urine. Animal experiments have shown that O-desmethylTramataj (Tramadol) is more potent than the parent substance by the factor 2 – 4. Its half-life t1/2,ß (6 healthy volunteers) is 7.9 h (range 5.4 – 9.6 h) and is approximately that of Tramataj (Tramadol). The inhibition of one or both types of the isoenzymes CYP3A4 and CYP2D6 involved in the biotransformation of Tramataj (Tramadol) may affect the plasma concentration of Tramataj (Tramadol) or its active metabolite. Up to now, clinically relevant interactions have not been reported. Tramataj (Tramadol) and its metabolites are almost completely excreted via the kidneys. Cumulative urinary excretion is 90 % of the total radioactivity of the administered dose. In cases of impaired hepatic and renal function the half-life may be slightly prolonged. In patients with cirrhosis of the liver, elimination half-lives of 13.3 + 4.9 h (Tramataj (Tramadol)) and 18.5 + 9.4 h (O- desmethylTramataj (Tramadol)), in an extreme case 22.3 h and 36 h respectively, have been determined. In patients with renal insufficiency (creatinine clearance < 5 ml/min) the values were 11 + 3.2 h and 16.9 + 3 h, in an extreme case 19.5 h and 43.2 h respectively. Tramataj (Tramadol) has a linear pharmacokinetic profile within the therapeutic dosage range. The relationship between serum concentrations and the analgesic effect is dose-dependent, but varies considerably in isolated cases. A serum concentration of 100 – 300 ng/ml is usually effective. The pharmacokinetics of Tramataj (Tramadol) and O-desmethylTramataj (Tramadol) after single-dose and multiple- dose oral administration to subjects aged 1 year to 16 years were found to be generally similar to those in adults when adjusting for dose by body weight, but with a higher between-subject variability in children aged 8 years and below. In children below 1 year of age, the pharmacokinetics of Tramataj (Tramadol) and O-desmethylTramataj (Tramadol) have been investigated, but have not been fully characterized. Information from studies including this age group indicates that the formation rate of O-desmethylTramataj (Tramadol) via CYP2D6 increases continuously in neonates, and adult levels of CYP2D6 activity are assumed to be reached at about 1 year of age. In addition, immature glucuronidation systems and immature renal function may result in slow elimination and accumulation of O-desmethylTramataj (Tramadol) in children under 1 year of age. On repeated oral and parenteral administration of Tramataj (Tramadol) for 6 – 26 weeks in rats and dogs and oral administration for 12 months in dogs haematological, clinico-chemical and histological investigations showed no evidence of any substance-related changes. Central nervous manifestations only occurred after high doses considerably above the therapeutic range: restlessness, salivation, convulsions, and reduced weight gain. Rats and dogs tolerated oral doses of 20 mg/kg and 10 mg/kg body weight respectively, and dogs rectal doses of 20 mg/kg body weight without any reactions. In rats Tramataj (Tramadol) dosages from 50 mg/kg/day upwards caused toxic effects in dams and raised neonate mortality. In the offspring retardation occurred in the form of ossification disorders and delayed vaginal and eye opening. Male fertility was not affected. After higher doses (from 50 mg/kg/day upwards) females exhibited a reduced pregnancy rate. In rabbits there were toxic effects in dams from 125 mg/kg upwards and skeletal anomalies in the offspring. In some in-vitro test systems there was evidence of mutagenic effects. In-vivo studies showed no such effects. According to knowledge gained so far, Tramataj (Tramadol) can be classified as non- mutagenic. Studies on the tumorigenic potential of Tramataj (Tramadol) hydrochloride have been carried out in rats and mice. The study in rats showed no evidence of any substance-related increase in the incidence of tumours. In the study in mice there was an increased incidence of liver cell adenomas in male animals (a dose-dependent, non-significant increase from 15 mg/kg upwards) and an increase in pulmonary tumours in females of all dosage groups (significant, but not dose-dependent). Precipitation will occur if Tramataj (Tramadol) 50mg/ml Solution for Injection is mixed in the same syringe with injections of diazepam, diclofenac sodium, indometacin, midazolam and piroxicam. Tramataj (Tramadol) 50mg/ml Solution for Injection must not be mixed with other medicinal products except those mentioned in section 6.6. From a microbiological point of view, the product should be used immediately. If not used immediately, in-use storage times and conditions prior to use are the responsibility of the user and would not normally be longer than 24 hours at 2 to 8°C, unless reconstitution / dilution has taken place in controlled and validated aseptic conditions. Keep ampoule in the outer carton. 2ml neutral glass type I glass ampoules. The prepared infusion solution should be made up immediately before use. – 24 hours with 4.2% sodium bicarbonate and Ringer’s solution.